Don’t forget containers and dumpsters are also great for Spring Clean-ups, Roof Replacements, Home Additions, Concrete work, Commercial Demolition & Construction projects. How long do I have it? Rental is for one week (7 days). You can extend that time for an added fee, just be sure to let us know in advance. Please keep in mind that drop off and removal times will be dependent on that day’s schedule, therefore time of day will be different. During the colder winter months two week rental time may be offered. How heavy can it get? A generous amount of weight is included in your base rental fee depending on the container size, but additional fees per ton are needed if the base weight is exceeded. Please remember these overages will be prorated based on the actual amount of weight your roll-off container goes over by. Am I responsible for water or snow weight? Both containers and Roll-Offs are not covered. Any rain or snow that gets in or is soaked up by the material does have an overall effect on the weight of your material. To prevent this from happening we suggest using a tarp to cover the material. You can purchase tarps at your local hardware store. How much room is needed to put a roll-off container in place? Due to the size of the truck used to transport these containers, a minimum of 70 feet in a straight line is required to perform the work. There are times during the process where the mechanism will require 18 feet of overhead clearance. Therefore things like basketball hoops, low power, telephone and cable lines along with overhanging trees should be discussed when choosing a container. How much room is needed to put a 6 yard container in place? Due to the size of the truck used to transport these containers, a minimum of 35 feet in a straight line is required to perform the work. There are times during the process where the mechanism will require 13 feet of overhead clearance. Therefore things like basketball hoops, low power lines, telephone lines and cable lines along with overhanging trees should be discussed when choosing a container. How wide does my driveway need to be? No matter what size container or Roll-off you choose, due to the width of the vehicle, the driveway must be over 9 feet wide. If there are upright structures such as fence posts or pillars, there must be at least 10 feet of clearance for our vehicle to enter the property. Can they damage my driveway? These containers are very heavy and could potentially damage your paved driveway. This is why we provide wooden planks to be place under the container to help protect your property. 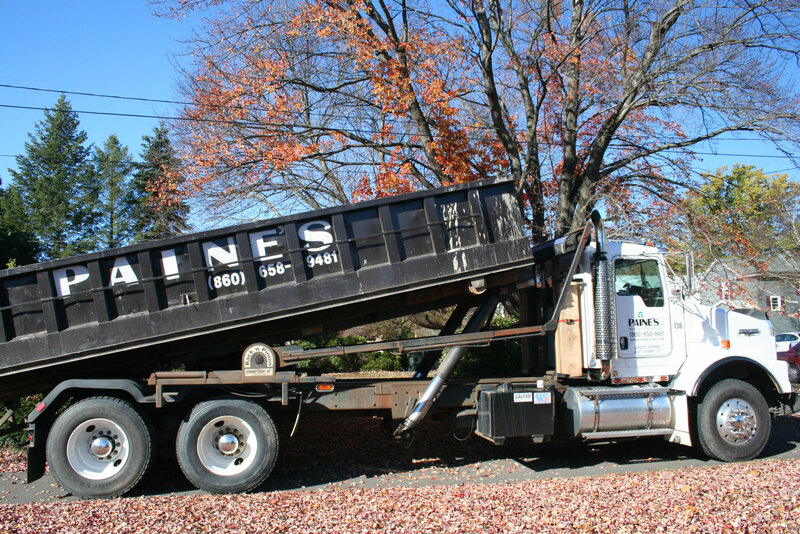 Even with planks some older or spider cracked driveways can still be damaged by our truck driving onto your driveway or the dumpster sitting on your driveway. A Roll-Off truck can weigh upwards of 13 tons without material in the container. So if our experienced drivers still have concerns regarding your driveway we will do our best to contact you and discuss your options. Can the Roll-off or container be placed on my lawn? Lawns, walkways and underground structures such as sprinkler systems or septic tanks are vulnerable to damage if we place the container on, near or drive over them. If the location you choose to have your container or Roll-off placed rises this concern you must be present at drop off and sign a damage waiver in advance. Climbing on or in a dumpster? Never climb on or in the container. The material inside might be sharp or slippery and cause injury. Our Roll-off containers have a convenient door in the back that opens so you may step in to load your material. When the container becomes full the door should be closed and secured, then the remaining items may be loaded up and over the side. Never load the container above the sides. It is our responsibility to transport the material safely to the disposal site. If the container is overloaded, material could fall off during transport and damage another vehicle or worse. As a result of this, if our professional drivers feel it is unsafe to haul, the Roll-Off or container will be left behind for you to off load and an attempt fee will be charged. Please do not park your car near the container. Your vehicle could be damaged as a result of the activities that occur near this equipment. Also, service could be delayed or an attempt fee could be charged if the container is blocked.